Long time ago I drew a series of animals on toilet paper rolls. I was drawing cartoonlike animals all the time back then, and I discovered that these animals worked very well in 3d on these little paper cylinders. My wife gets tired of my art attacks every now and then, so these little Toilet Zoo has not survived. 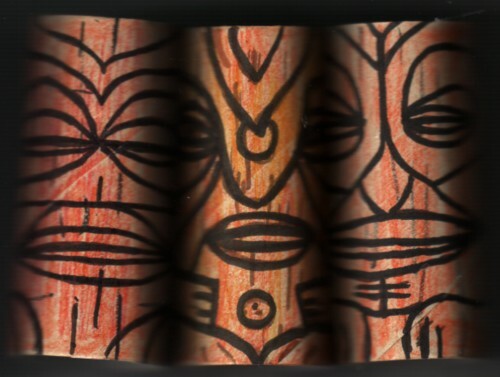 Recently I started making Tiki God statues of toilet paper rolls. I tried to make a scan of some of them, but it is difficult to see how they look. I still have no camera, but I will ask my son to make a photo of the complete collection so far one of these days. For a soundtrack to these Toilet Tiki Gods I had a 45 in mind that the Walt Disney company released in the sixties. The song is ”In the Tiki room” and it is real good. But I just spend an hour searching for this record and couldn’t find it. So this will have to wait till later. I did find the version that Hilary Duff did of the song for the Disney Mania CD, but that is a lousy version compared to the original!